Belated news just in that Antoine Larricq and Vassilis Fotilas at Fraser Yachts in Monaco have signed the 34.11m motor yacht Pure White for sale. Pure White was built by the Arno yard in 2007 and this Leopard superyacht features accommodation for nine guests in five staterooms. 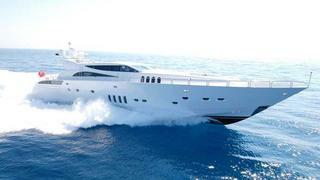 Her triple 2,400hp MTU engines give her a cruising speed of 36 knots and a range of 500 nautical miles. Her asking price is €5.9 million.